This simple recipe below is for the Ocean Trout and it is perfect for a summary weekend lunch. If you buy a fresh beautiful fish on Saturday morning it will take you less than 20 minutes to surprise your family or guests. It goes well with any light salad or just cut vegetables and it is always a success! Baking this trout in the oven produces very similar result in case you feel like a tender juicy fish on a rainy winter Sunday. 1. Chop the tips of the dill and put the stems aside. Mix the mayonnaise with dill, horseradish, garlic, salt and pepper. Using your hands rub the fish inside out with the 2/3 of the mayonnaise mixture. 2. Slice tomatoes, lay the slices inside the fish along with the remaining dill sprigs and mayonnaise mixture. 3. Wrap the whole fish in the aluminium foil and if possible leave it aside for 30 minutes, for better results the fish needs to be at room temperature to start a cooking process. 4. BBQ on medium-high heat, less than 200C. Calculate the timing, approximately 1.5 minute per 500g on each side. For example, 2kg fish 6 minutes on each side. 5. 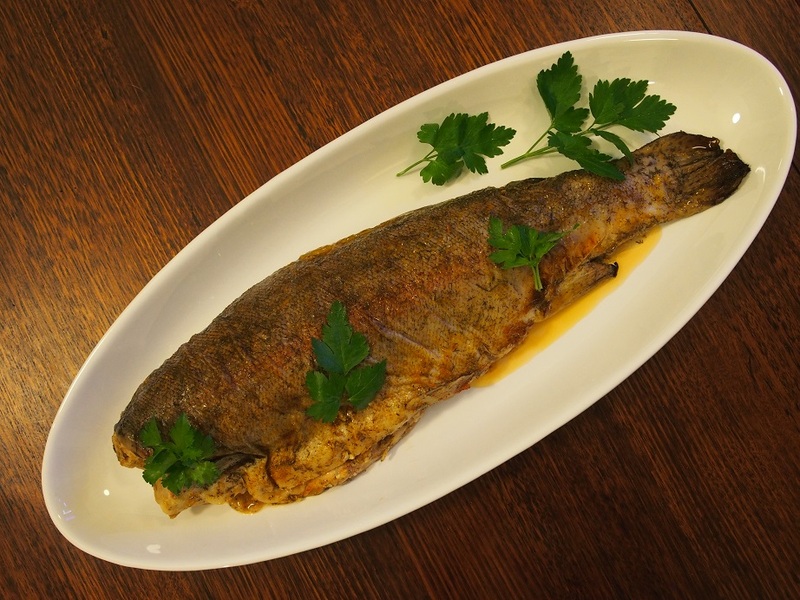 Alternatively the fish can be baked at 185C. For 2kg fish bake for about 50 minutes.